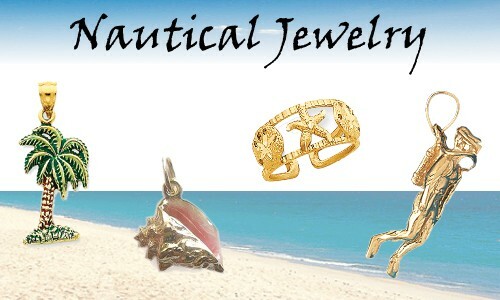 Nautical sealife jewelry in 14k gold and sterling silver celebrates your love of the ocean. From a honeymoon trip in tropical paradise to memories of vacations with family and friends, we have a large collection of sea themed jewelry and gifts. From palm tree charms, to a lighthouse for your bracelet, sand dollars as detailed as those found on the beach, earrings and pedants for scuba diving divers, sea life gifts for boaters, fisherman anyone that loves the water and boating. If you have a passion for water browse our online catalog and shop our jewelry, most items on sale.